“A plan for Arkansas that includes more and better paying jobs, increased attainment levels in higher education; a strong diversified economy, and competitive tax rates,” Hutchinson said. Hutchinson called for a $2.3 million increase in funding for 24 new state troopers over the next two years. He also included additional funding for 30 additional probation and parole officers for the state. His proposed budget also calls for an additional $60 million to be allocated to raise teacher pay in the state, an increase of $1.1 million dollars to the Division of Agriculture and a $1.5 million increase for the University of Arkansas for Medical Sciences. Hutchinson also talked about the state’s computer science program and the creation of a Technology and Innovation Council. “This Innovation Council will bring industry leaders and technology entrepreneurs together to create new energy and support for tomorrow’s problem solvers and thought leaders in software design, cyber security, data analytics, blockchain technology and all those other things that you’re experts in,” Hutchinson said. According to Hutchinson, 2,000 more high school students are taking computer-coding courses than the year before. The governor said he wants to pass the third phase of proposed tax cuts this session. The plan would flatten the rate for all taxpayers to 5.9 percent over the next four years as well as simplify the rate structure. In the first year, the new, proposed plan should reduce tax revenue by $47.4 million. Hutchinson also cited the reduction of the grocery tax by $61.1 million and a $50 million low income tax cut. Overall, the total tax reduction for fiscal year 2020 would be $158.5 million dollars if the tax cut passed. Hutchinson also had words for those who believe the tax rates go too far. “In the last four years, we have cut taxes carefully and we have continued to invest in education, prisons, and even funding expanded Medicaid in the state. Additionally, we have set aside over $125 million in savings. Those commitments remain,” Hutchinson said. Hutchinson also spoke about things he was proud to accomplish over his first term with the legislature including reforming the child welfare system, passing and implementing the first two phases of his tax cut plan and reducing the size of the executive branch of the state government by more than 1,400 employees. 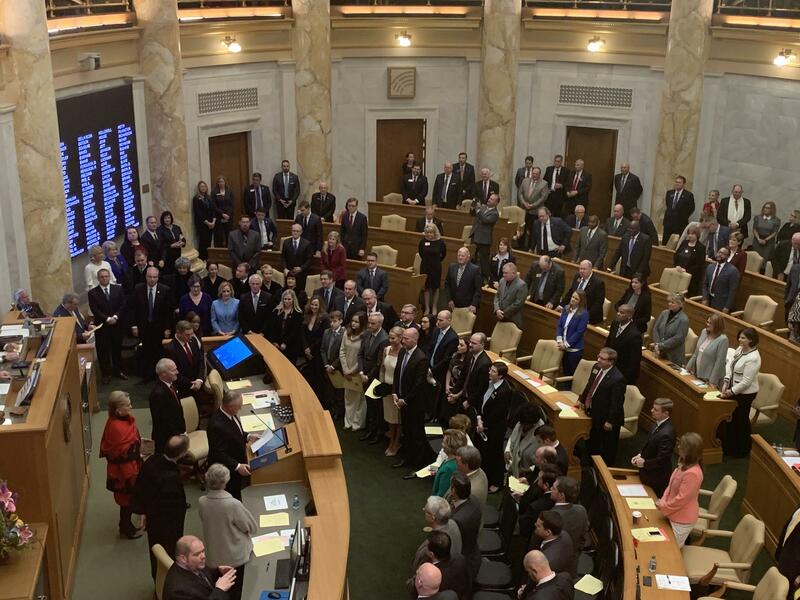 In addition to the governor’s inaugural oath and state of the state speech, the joint session also announced the statewide election data from the November election and swore in other elected constitutional officers. While Arkansas lawmakers have already filed bills on gun registration, automatic voter registration and other topics, one of the main issues leadership wants to fix during the 2019 session that begins Monday is ethics reform.